This is a problem that has driven anyone that has studied climate science up the wall. Premise: Venus has an adiabatic index γ (gamma) and a temperature lapse rate λ (lambda). Earth also has an adiabatic index and temperature lapse rate. These have been measured, and for the Earth a standard atmospheric profile has been established. The general relationship is based on thermodynamic principles but the shape of the profile diverges from simple applications of adiabatic principles. In other words, a heuristic is applied to allow it to match the empirical observations, both for Venus and Earth. See this link for more background. Assigned Problem: Derive the adiabatic index and lapse rate for both planets, Venus and Earth, using only the planetary gravitational constant, the molar composition of atmospheric constituents, and any laws of physics that you can apply. The answer has to be right on the mark with respect to the empirically-established standards. Caveat: Reminder that this is a tough nut to crack. Solution: The approach to use is concise but somewhat twisty. We work along two paths, the initial path uses basic physics and equations of continuity; while the subsequent path ties the loose ends together using thermodynamic relationships which result in the familiar barometric formula and lapse rate formula. The initial assumption that we make is to start with a sphere that forms a continuum from the origin; this forms the basis of a polytrope, a useful abstraction to infer the generic properties of planetary objects. 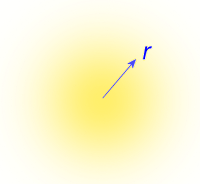 This becomes a variation of the Virial Theorem relating internal energy to potential energy. Now we bring in the thermodynamic relationships, starting with the ideal gas law with its three independent variables. On this path, we make the assertion that the Gibbs free energy will be minimized with respect to perturbations. i.e. a variational approach. Noting that the system is closed with respect to entropy changes (an adiabatic or isentropic process) and substituting the ideal gas law featuring a molar gas constant for the last term. We still need to derive the adiabatic index, by coupling the lapse rate formula back to the hydrostatic equilibrium formulation. Recall that the perfect adiabatic relationship (the Poisson's equation result describing the potential temperature) does not adequately describe a standard atmosphere -- being 50% off in lapse rate -- and so we must use a more general polytropic process approach. Now we have both the lapse rate, barometric formula, and Poisson's equation derived based only on the gravitational constant g, the gas law constant R, the average molar molecular weight of the atmospheric constituents m, and the average degrees of freedom N.
All the numbers are spot on with respect to the empirical data recorded for both Earth and Venus, with supporting figures available here. The rough derivation that I previously posted to explain the empirical data was not very satisfying in its thoroughness. The more comprehensive derivation in this post serves to shore up the mystery behind the deviation from the adiabatic derivation. The key seems to be correctly accounting for the internal energy necessary to maintain the gravitational hydrostatic equilibrium. Since the polytropic expansion describes a process, the actual atmosphere can accommodate these constraints (while minimizing Gibbs free energy under constant entropy conditions) by selecting the appropriate polytropic index. The mystery of the profile seems not so mysterious anymore. Criticisms welcome as I have not run across anything like this derivation to explain the Earth's standard atmosphere profile nor the stable Venus data (not to mention the less stable Martian atmosphere). The other big outer planets filled with hydrogen are still an issue, as they seem to follow the conventional adiabatic profile, according to the few charts I have access to. The moon of Saturn, Titan, is an exception as it has a nitrogen atmosphere with methane as a greenhouse gas. BTW, this post is definitely not dedicated to Ferenc Miskolczi. Please shoot me if I ever drift in that direction. It's a tough slog laying everything out methodically but worthwhile in the long run. D. J. Lorenz and E. T. DeWeaver, “Tropopause height and zonal wind response to global warming in the IPCC scenario integrations,” Journal of Geophysical Research: Atmospheres (1984–2012), vol. 112, no. D10, 2007. J. P. Syvitski, S. D. Peckham, R. Hilberman, and T. Mulder, “Predicting the terrestrial flux of sediment to the global ocean: a planetary perspective,” Sedimentary Geology, vol. 162, no. 1, pp. 5–24, 2003. Added Fig 3: This study also suggests an average lapse rate of 6.1C/km over the northern hemisphere. I. Mokhov and M. Akperov, “Tropospheric lapse rate and its relation to surface temperature from reanalysis data,” Izvestiya, Atmospheric and Oceanic Physics, vol. 42, no. 4, pp. 430–438, 2006. Since I posted this derivation, I received feedback from several other blogs which I attached as comments below this post. In the original post I concluded by saying that I was satisfied with my alternate derivation, but after receiving the feedback, there is still the nagging issue of why the Venus lapse rate profile can be so linear in the lower atmosphere even though we know that the heat capacity of CO2 varies with temperature (particularly in the high temperature range of greater than 500 Kelvin). This is internal energy due to gravitational potential energy. This will generate a linear lapse rate profile of temperature that decreases with increasing altitude. Note however that this does not depend on the specific heat of the constituent atmospheric molecules. That is not surprising since it only uses the Ideal Gas law, with no application of the variational Gibbs Free Energy approach used earlier. What this gives us is a universal lapse rate that does not depend on the specific heat capacity of the constituent gases, only the mean molar molecular weight, m. This is of course an interesting turn of events in that it could explain the highly linear lapse profile of Venus. However, plugging in numbers for the gravity of Venus and the mean molecular weight (CO2 plus trace gases), we get a lapse rate that is precisely twice that which is observed. The "obvious" temptation is to suggest that half of the value of this derived hydrodynamic lapse rate would position it as the mean of the lapse rate gradient and an isothermal lapse rate (i.e. slope of zero). The rationale for this is that most of the planetary atmospheres are not any kind of equilibrium with energy flow and are constantly swinging between an insolating phase during daylight hours, and then a outward radiating phase at night. The uncertainty is essentially describing fluctuations between when an atmosphere is isothermal (little change of temperature with altitude producing a MaxEnt outcome in distribution of pressures, leading to the classic barometric formula) or isentropic (where no heat is exchanged with the surroundings, but the temperature can vary as rapid convection occurs). J. Levine, The Photochemistry of Atmospheres. Elsevier Science, 1985. "The value chosen for the convective adjustment also influences the calculated surface temperature. In lower latitudes, the actual temperature decrease with height approximates the moist adiabatic rate. Convection transports H2O to higher elevations where condensation occurs, releasing latent heat to the atmosphere; this lapse rate, although variable, has an average annual value of 5.7 K/km in the troposphere. In mid and high latitudes, the actual lapse rates are more stable; the vertical temperature profile is controlled by eddies that are driven by horizontal temperature gradients and by topography. These so-called baroclinic processes produce an average lapse rate of 5.2 K/km - It is interesting to note that most radiative convective models have used a lapse rate of 6.5 K km - which was based on date sets extending back to 1933. We know now that a better hemispherical annual lapse rate is closer to 5.2 K/km, although there may be significant seasonal variations. " BTW, the following references are very interesting presentations on the polytropic approach. “Polytropes.” [Online]. Available: http://mintaka.sdsu.edu/GF/explain/thermal/polytropes.html. [Accessed: 19-May-2013]. B. Davies, “Stars Lecture.” [Online]. Available: http://www.ast.cam.ac.uk/~bdavies/Stars2 . [Accessed: 28-May-2013]. A number of Chinese academics [3,4] are attacking the polytropic atmosphere problem from an angle that I hinted at in the original Standard Atmosphere Model and Uncertainty in Entropy post. The gist of their approach is to assume that the atmosphere is not under thermodynamic equilibrium (which it isn't as it continuously exchanges heat with the sun and outer space in a stationary steady-state) and therefore use some ideas of non-extensible thermodynamics. Specifically they invoke Tsallis entropy and a generalized Maxwell-Boltzmann distribution to model the behavioral move toward an equilibrium. This is all in the context of self-gravitational systems, which is the theme of this post. Why I think it is intriguing, is that they seem to tie the entropy considerations together with the polytropic process and arrive at some very simple relations (at least they appear somewhat simple to me). The so-called q-factor is a non-extensivity parameter which indicates how much the distribution deviates from MB statistics. As q approaches 1, the expression gradually trasforms into the familiar MB exponentially damped v^2 profile. Note that this again has no dependence on the specific heat of the constituent gases, and only assumes an average molecular weight. If q=7/6 or Q = 1-q = -1/6, we can model the f=6 lapse rate curve that we fit to earlier. There is nothing special about the value of f=6 other than the claim that this polytropic exponent is on the borderline for maintaining a self-gravitational system . Note that as q approaches unity, the thermodynamic equilibrium value, the lapse rate goes to zero, which is of course the maximum entropy condition of uniform temperature. The Tsallis entropy approach is suspiciously close to solving the problem of the polytropic standard atmosphere. Read Zheng's paper for their take  and also Plastino . The cut-off in the polytropic distribution (5) is an example of what is known, within the field of non extensive thermostatistics, as “Tsallis cut-off prescription”, which affects the q-maximum entropy distributions when q < 1. In the case of stellar polytropic distributions this cut-off arises naturally, and has a clear physical meaning. The cut-off corresponds, for each value of the radial coordinate r, to the corresponding gravitational escape velocity. This has implications for the derivation of the homework problem that we solved at the top of this post, where we eliminated one term of the integration-by-parts solution. Obviously, the generalized MB formulation does have a limit to the velocity of a gas particle in comparison to the classical MB view. The tail in the statistics is actually cut-off as velocities greater than a certain value are not allowed, depending on the value of q. As q approaches unity, the velocities allowed (i.e. escape velocity) approach infinity. Polytropic distributions happen to exhibit the form of q-MaxEnt distributions, that is, they constitute distribution functions in the (x,v) space that maximize the entropic functional Sq under the natural constraints imposed by the conservation of mass and energy. The enduring question is does this describe our atmosphere adequately enough? Zheng and company certainly open it up to another interpretation. Y. Zheng, W. Luo, Q. Li, and J. Li, “The polytropic index and adiabatic limit: Another interpretation to the convection stability criterion,” EPL (Europhysics Letters), vol. 102, no. 1, p. 10007, 2013. Z. Liu, L. Guo, and J. Du, “Nonextensivity and the q-distribution of a relativistic gas under an external electromagnetic field,” Chinese Science Bulletin, vol. 56, no. 34, pp. 3689–3692, Dec. 2011. M. V. Medvedev and G. Rybicki, “The Structure of Self-gravitating Polytropic Systems with n around 5,” The Astrophysical Journal, vol. 555, no. 2, p. 863, 2001. A. Plastino, “Sq entropy and selfgravitating systems,” europhysics news, vol. 36, no. 6, pp. 208–210, 2005. WHUT,Looking only superficially at your derivation, I’m left wondering, how you can can derive any other polytropic process than adiabatic. I can believe that some other polytrope gives a better agreement with the average lapse rate, but I cannot see any fundamental justification for any particular value. It’s known that the dry adiabatic lapse rate is close to the real one in some limited parts of the atmosphere, while a moist adiabat applies to some other parts and no adiabat in yet other cases. It seems to me extremely unlikely that formal justification can be found for the validity of any other polytrope. If you wish to use the latest argument you must state that the standard derivation of the adiabatic lapse rate is wrong. One point you mention is the radial mass conservation, but the Earth radius is very large in comparison with the height of the troposphere and all reasonably dense atmosphere. Therefore the radial effects are negligible. I don’t understand at all what you are saying about the ideal gas law or, how you could get any support from that. Maxent type ideas may give reasonable approximations, but as always they lack rigor, and have more the nature of a rule of thumb. Looks like you arbitrarily picked n = 5 for the polytropic term. Care ‘splain that, Ricky? The polytrophic index n=5 derives from f=3/2*(1+N/2) and f=n+1. For Venus, CO2 is the major gas and that is a molecule with 6 degrees of freedom at this range of temperatures. So N=6, f=6, and therefore n=5. For Earth, N=5, f=5.25, and n=4.25. What is perhaps confusing is why I singled out n=5 in the post. That one happens to have an analytical solution for the Lane-Emden equation. But I don't use that particular solution beyond that point. "Interesting that the Venus CO2 atmosphere is forever phase-changing. CO2 has a supercritical phase that blurs the distinction between gas and liquid phases. The climatologist Peter Stone had a theory for lapse rates based on rotating atmospheres . For Mars, he said the curves shown above have a mean lapse rate of 2.5 K/km. His own theory predicted 2 k/km, but that one is really complex. P. H. Stone, “A simplified radiative-dynamical model for the static stability of rotating atmospheres,” J. Atmos. Sci, vol. 29, no. 3, pp. 405–418, 1972. The radiative equilibrium and dusty thin atmosphere of Mars are of course also important." If you derive the dry adiabatic lapse rate as done in the Wikipedia article on lapse rate you get more than that it is constant, you get the constant itself, namely g/c_p K/km. For Earth’s troposphere this is 9.8/1.00 = 9.8 K/km. For Venus it is 8.9/1.13 = 7.82 K/km; Figure 5.2 on p.192 of Marov and Grinspoon’s The planet Venus plots measurements by Venera-9 through 15 and the Pioneer-Venus Large probe, showing around 8 K/km, in good agreement with theory. Looking more carefully at that figure, which I put up here, I’d say it was closer to 7.3 K/km. At 55 km altitude the temperature has declined about 400 K from that at the surface; 400/55 = 7.3. I agree with the formula in the Wikipedia article on lapse rate, namely g/c_p. g*MW/c_p isn’t remotely near correct. Are you suggesting that there are 3 or 4 more degrees of freedom unaccounted for in the CO2 molecule? and note (two lines above that phrase) the temperature-dependent value of 1134 J/kg K for CO2 at 730 K, leading to 7.82 K/km for an ideal gas, bumped up slightly to 8.08 K/km at 90 atmospheres. I have no idea why the empirically observed value is 7.3 K/km, but in any event that’s way less than 8.87/0.839 = 10.57 K/km where 0.839 is c_p for CO2 at STP. CO2 has vibrational modes of energy 0.3, 0.17, and 0.085 eV. These correspond to temperatures of 3400K, 2000K, and 980K. The highest temperature of Venus is +700K so that the lowest energy vibrational mode is only starting to kick in at that temperature. Beats me. Maybe 90 atmospheres is enough to bend an otherwise linear molecule, which would add a low-energy rotational degree of freedom, low enough to be relevant at 730 K. Could the high pressure also smear out the thresholds you cite? All I had to go on was the book’s figure of 1.134 kJ/kg for c_p, which gave a lapse rate not far off the observed value. No idea where 1.134 came from. "Math is a tool that transforms input to output. As I’m sure that your output is wrong, I assume that your input is also wrong. You have probably done the math in between correctly. In the previous case of lapse rate you were talking on “virial” something, don’t remember the exact phrase.. My impression was that you didn’t know what you were talking about, but didn’t consider that interesting enough to dig deeper." In particular, DeWitt Payne points out (like Vaughan Pratt) that Venus has higher degrees of freedom for CO2, than appears for its vibrational model energies. Did you see the derivation in Ray Pierrehumbert's "Principles of Planetary Climate"? As best as I recall it, yours is both more thorough and clearer to me. Congratulations. I will have to pick up Pierre's book, thanks for the tip.